Mother Nature serves us up a good helping of dark night sky in Pisgah National Forest, thanks to zero street lights on our road and our location two miles within Pisgah National Forest, between two ridgelines that block a lot of the small town night lighting around us. So we like to provide a little calendar each year of what stargazing guests at the Inn on Mill Creek might see, other than the Milky Way (which, by the way, is awesome on a dark clear night flowing across the sky from the Lake House to the Main House). 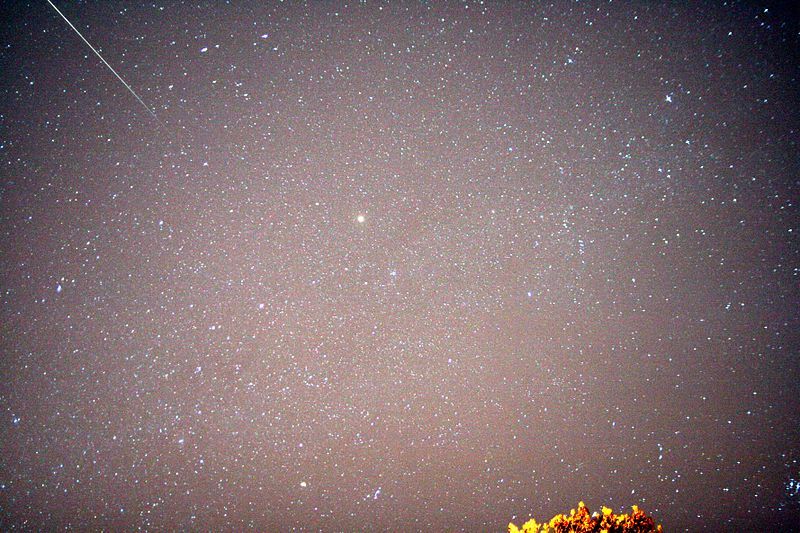 The Geminids Meteor Shower…don’t miss it in December! July 28-29: Southern Delta Aquarids Meteor Shower. If the skies are clear to the east after midnight, look up and you could possibly see up to 20 meteors per hour at the peak of this meteor shower. August 12-13: Perseids Meteor Shower. After midnight, look to the constellation Perseus in the northeast for this fantastic meteor shower, which can produce up to 60 meteors per hour during the peak dates in August. October 21-22: Orionids Meteor Shower. Best viewing for the Orionids is the eastern sky after midnight. This meteor shower does not produce as big a show as the Perseids, but the sky will be dark, and if it’s clear, you may catch some shooting stars. November 17-18: Leonids Meteor Shower. The Leonids can produce 40 meteors per hour after midnight at their peak dates in November, streaming from the constellation Leo. Every 33 years, the peak brings hundreds of meteors each hour, but the most recent year for that was 2001, so we have several years until the next really big show. December 13-14: Geminids Meteor Shower. Don’t let December’s brisk evening temperatures keep you from heading outdoors to catch this stellar meteor shower coming from the constellation Gemini in the eastern sky. You might see upwards of a hundred shooting stars each hour after midnight under optimal conditions. And there’s no moon this year during the peak, so skies will be dark. Finally, how can we close this post without mentioning the ISS — International Space Station — crossing over the Inn at different hours during different days each month, sometimes at night where it is clearly visible, a non-blinking bright white light moving slowly and steadily across the night sky. The ISS will be headed over us pre-sunrise on January 31, around 6:45am, and just before 6am on February 1. After that, the next nighttime viewing will be at 7:43pm on February 9. You can track the ISS going over your house at http://spaceflight1.nasa.gov/realdata/sightings.